Continuation from Part 1, Part 2, Part 3 and Part 4. 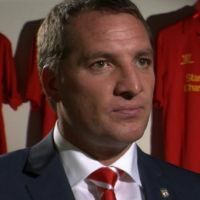 I know the joke about Liverpool fans spending 20 years saying “this could be our year” has run its course now, but there is a definite optimism surrounding Anfield this season after the appointment of budget tiki-taka master, Brendan Rodgers. There has been a decent outlay on former Swansea players Fabio Borini and Joe Allen and the wage bill has been trimmed with Fabio Aurelio, Dirk Kuyt, Maxi Rodriguez, Alberto Aquilani and Craig Bellamy finding employment elsewhere. Much is made of how many times Liverpool hit the bar last season and, if a percentage of those had gone in, then we’d have had a very different final league position and King Kenny would still be in a job. But the club needed to reinvent itself after the debacle around Luis Suarez and the self-aggrandizing t-shirts worn in support of him – singularly the most misguided and embarrassing thing since Bryan Robson’s appearance in Jossy’s Giants. A fully fit squad is going to be a challenge to anyone this season, especially if they embrace Rodgers’ way. Liverpool fans seem to be confident so I’m going to follow their lead and predict a Champions League place for the Reds (unless Di Matteo wins his second Big Cup in succession). Maybe Alex should have gotten out while he can. 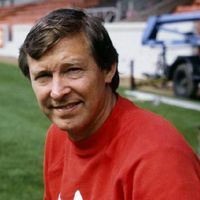 The perception is that Alex Ferguson is not being given all that much money to spend, considering that he manages the wealthiest club in the world. Just Twelve million pounds was dropped on Shinji Kagawa this summer but 90 million-plus on David De Gea, Bebe, Anders Lindegaard, Phil Jones, Ashley Young, Chris Smalling, Gabriel Obertan (yeah, that worked) and Antonio Valencia in the three seasons prior. It’s not like there has been no money – but maybe just not money spent in the right places. United were so short last season that Paul Scholes came out of retirement and 38 year old Ryan Giggs still plays regularly. Darren Fletcher is facing an uncertain future with illness and played just 8 times last season. But United look short of quality in midfield this season. This might be the season where the old guard hand over to Tom Cleverley and perhaps even Shinji Kagawa. Regardless, even Ferguson’s ability to get the best out of his players may not be enough to overturn their city rivals once again. It’ll be all Brian Marwood’s fault when City fall short this season. 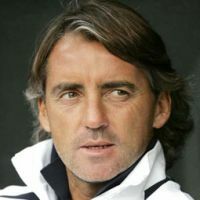 There’s no doubt that the billion dollar team need to offload players, something they are finding difficult due to absurd wages that Sheikh Mansour sanctioned when told that Roque Santa Cruz and Emmanuel Adebayor were good players. Santa Cruz, Adebayor, Nigel de Jong, Adam Johnson, Kolo Toure and maybe even the likes of Edin Dzeko may have little role to play this season. Until then, the purse strings have been supposedly kept awkwardly knotted by sports director executive person Brian Marwood. City have reportedly tried to sign Daniele de Rossi, Scott Sinclair, Robin van Persie and Daniel Agger but so far the only newcomers are Jack Rodwell and, arguably, slimmed-down outcast Carlos Tevez. I’m sure there will be additions before the transfer window “slams shut” but City saw largely the same squad – put together for an insane amount of money – stumble over the line in the 93rd minute of the final game of the season. It may be even harder this season. If the Arsenal fans are anything to go by – and they would be the ones who know – this is the season when it all comes to fruition. Arsene Wenger has finally abandoned his policy of signing unproven players, bigging them up, giving them League Cup games and then realising a few years later that they are not actually good enough. Perversely, the very fact that he has managed to compete for Champions League qualification in spite of all this is a reason why Wenger should be recognised as the second best manager of the Premier League era. Last season a flurry of transfer activity including the signing of finished articles like Andre Santos, Mikel Arteta and Per Mertersacker helped Arsenal eventually nick third place off Spurs on the final day of the season. 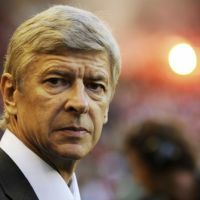 And Wenger has continued that policy with the capture of Olivier Giroud (25), Lukas Podolski and Santi Cazorla (both 27). Even if Robin van Persie goes it should not really matter all that much as he has recruited two top class strikers in his place and a brilliant winger in Cazorla. With Jack Wilshere – set to become the best midfielder of his generation – and the burgeoning class of Alex Oxlade-Chamberlain and occasional genius of Theo Walcott it’s hard to see Arsenal not being in the mix at the business end of the season. Hopefully the days of giving games to mediocre talent like Abou Diaby, Nicklas Bendtner, Denilson, Carlos Vela and Emmanuel Eboue are a thing of the past and Wenger has finally copped on to himself. Thomas Vermaelen has captured the feeling of a lot of fans when he said: “I feel really positive for the new season. If we all stay fit, the squad is strong enough to compete for the title”.